You should see a lot of lines, symbolizing roads. 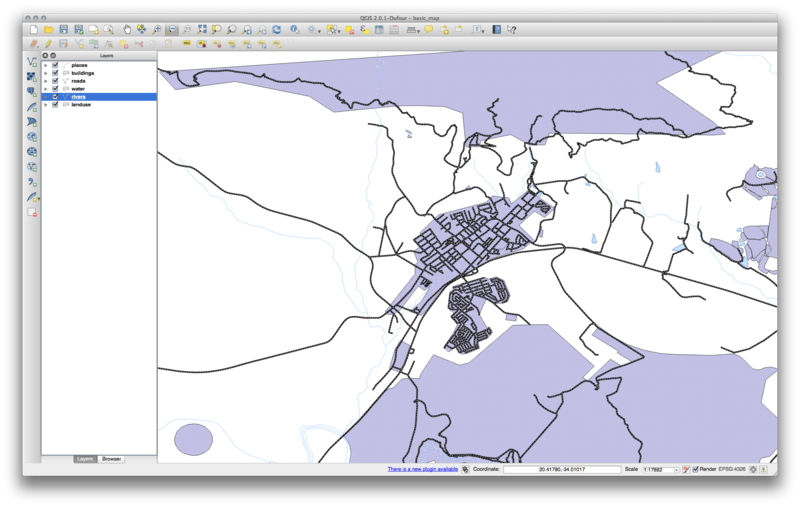 All these lines are in the vector layer that you just loaded to create a basic map. 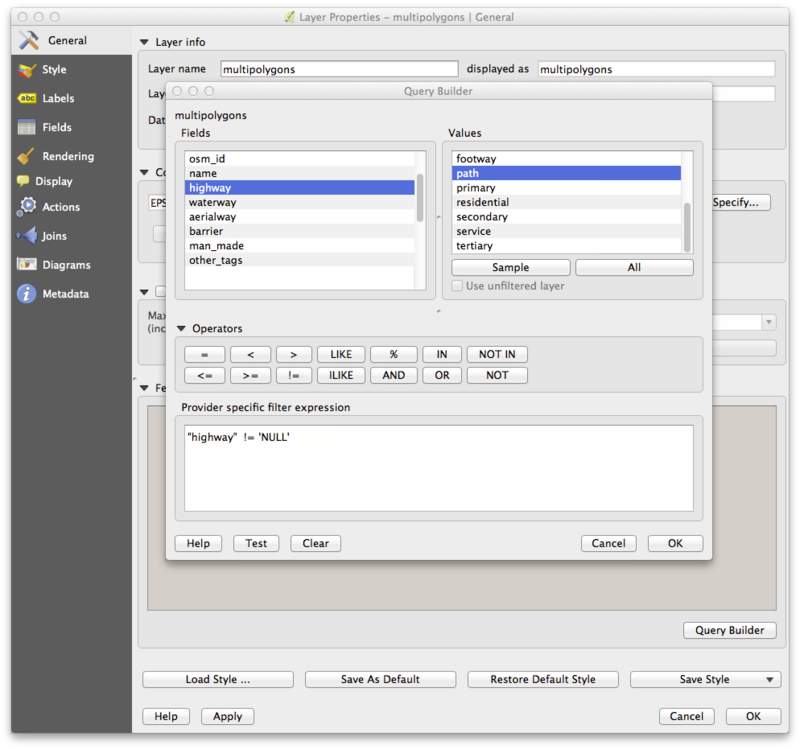 Refer back to the image showing the interface layout and check that you remember the names and functions of the screen elements. All the vector layers should be loaded into the map. It probably won’t look nice yet though (we’ll fix the ugly colors later). Verify that the colors are changing as you expect them to change. It is enough to change only the water layer for now. An example is below, but may look different depending on the color you chose. If you want to work on only one layer at a time and don’t want the other layers to distract you, you can hide a layer by clicking in the check box next to its name in the Layers list. 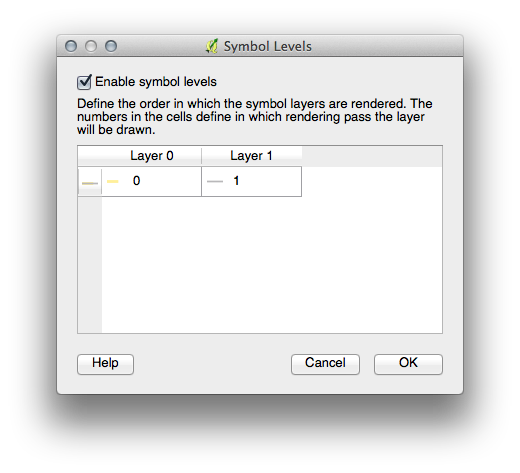 If the box is blank, then the layer is hidden. If you are a Beginner-level user, you may stop here. 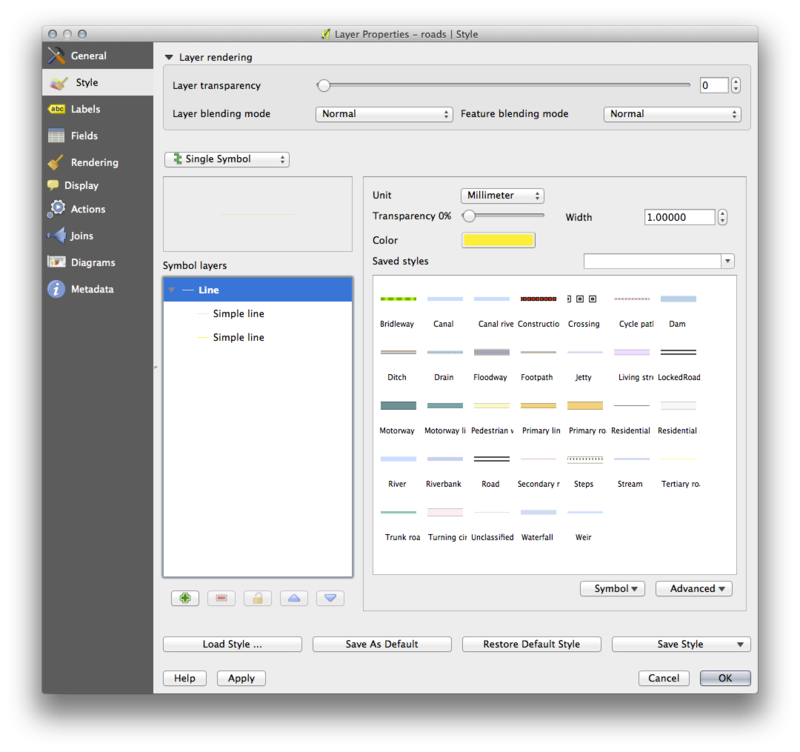 Use the method above to change the colors and styles for all the remaining layers. Try using natural colors for the objects. For example, a road should not be red or blue, but can be gray or black. Also feel free to experiment with different Fill Style and Border Style settings for the polygons. 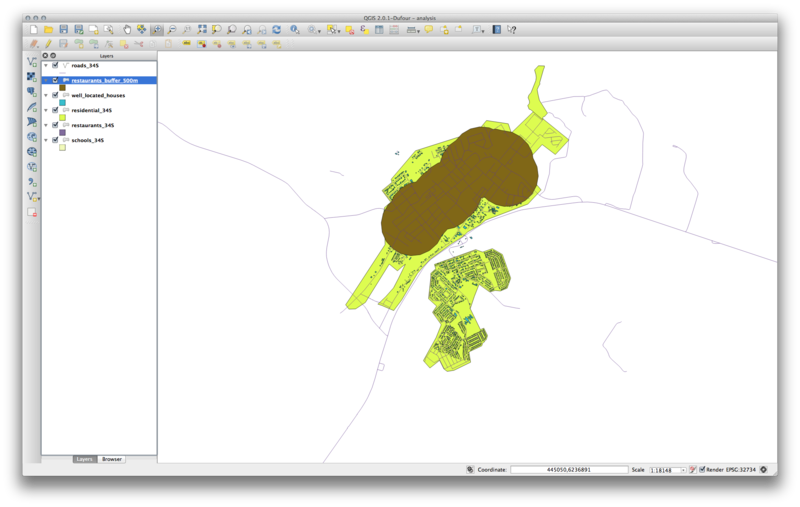 Customize your buildings layer as you like, but remember that it has to be easy to tell different layers apart on the map. The lowest symbol layer is a broad, solid yellow line. 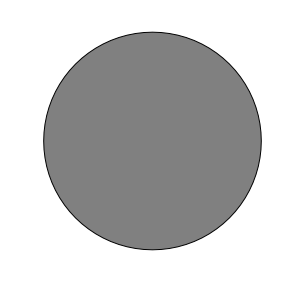 On top of it there is a slightly thinner solid gray line. Experiment with different values to get different results. Open your original map again before continuing with the next exercise. The NAME field is the most useful to show as labels. This is because all its values are unique for every object and are very unlikely to contain NULL values. 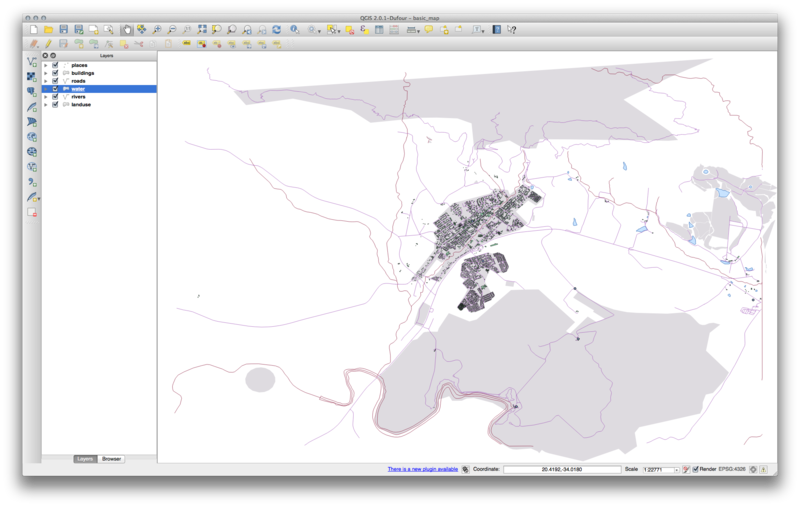 If your data contains some NULL values, do not worry as long as most of your places have names. 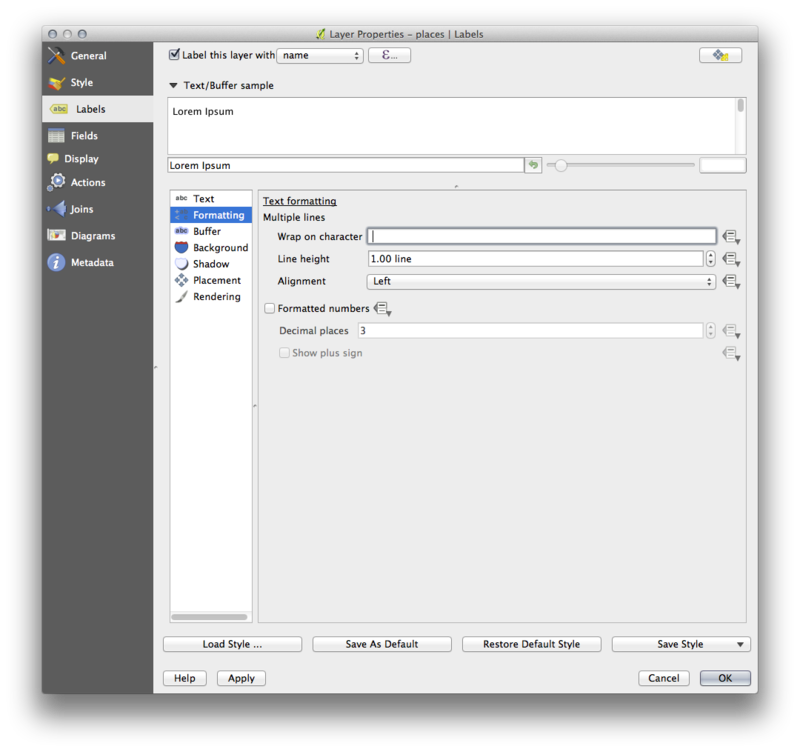 Use a font size of 10, a Label distance of 1,5 mm, Symbol width and Symbol size of 3.0 mm. Enter a space in this field and click Apply to achieve the same effect. 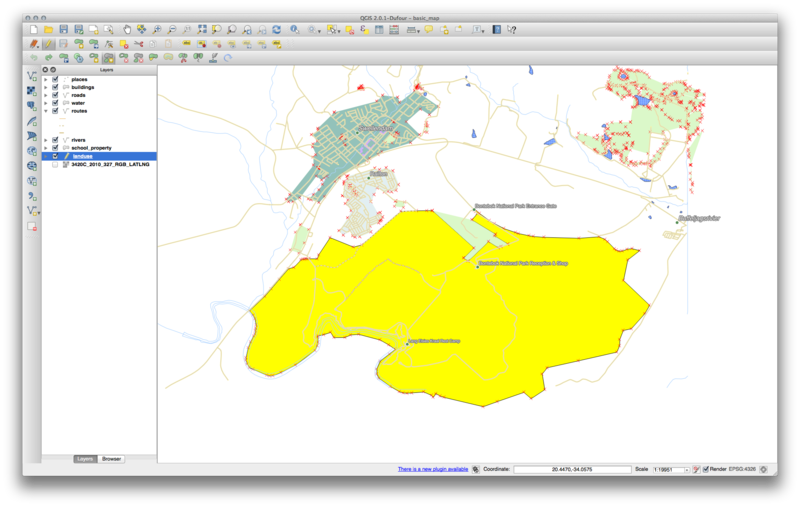 In our case, some of the place names are very long, resulting in names with multiple lines which is not very user friendly. You might find this setting to be more appropriate for your map. 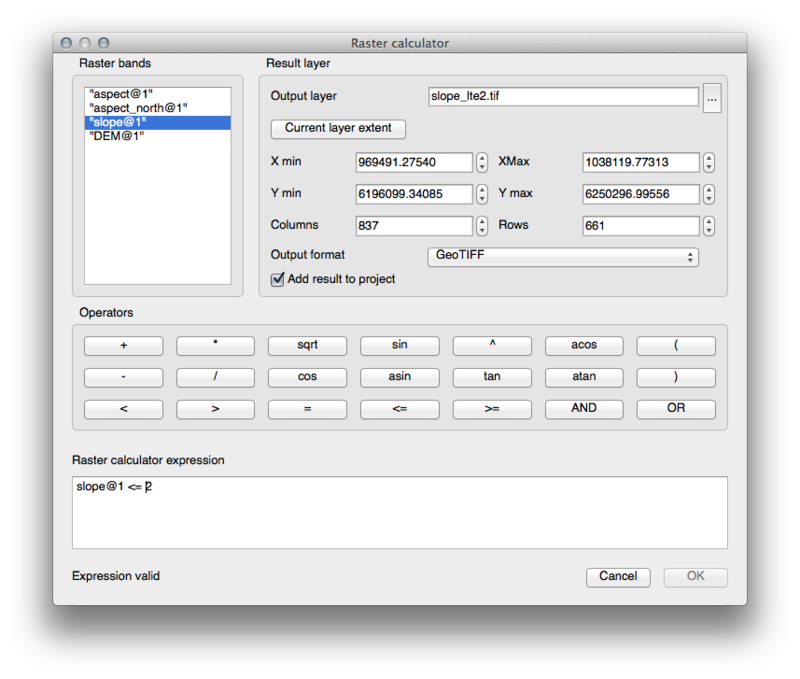 Still in edit mode, set the FONT_SIZE values to whatever you prefer. 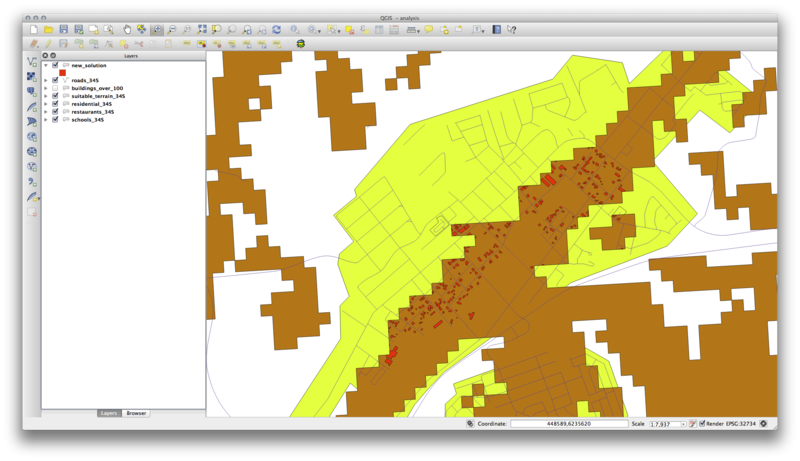 The example uses 16 for towns, 14 for suburbs, 12 for localities and 10 for hamlets. Remember to save changes and exit edit mode. Undo your edit before continuing with the exercise for the next tool. 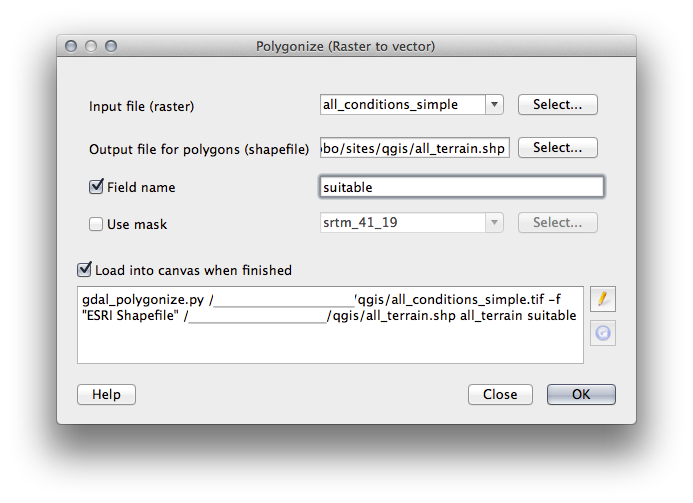 Use the Merge Selected Features tool, making sure to first select both of the polygons you wish to merge. original polygon’s OGC_FID will not be 1. 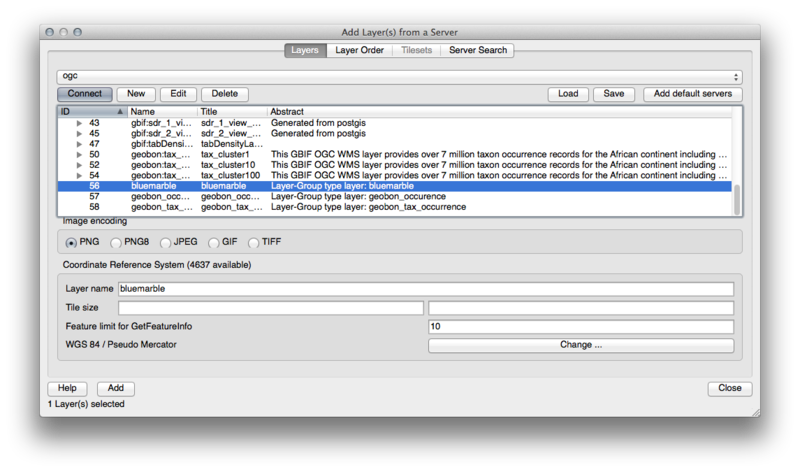 Just choose the feature which has an OGC_FID. 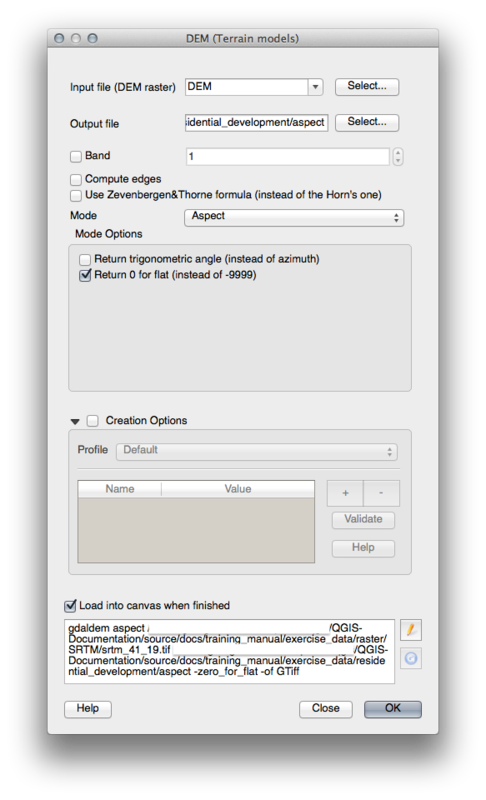 Using the Merge Attributes of Selected Features tool will keep the geometries distinct, but give them the same attributes. 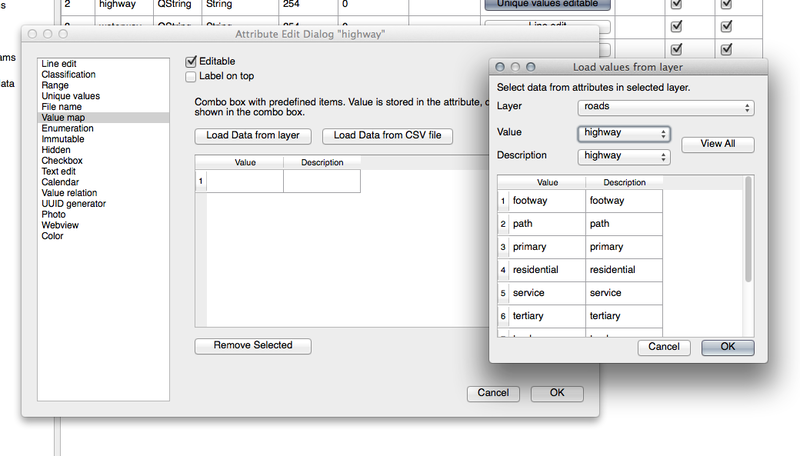 For the TYPE, there is obviously a limited amount of types that a road can be, and if you check the attribute table for this layer, you’ll see that they are predefined. 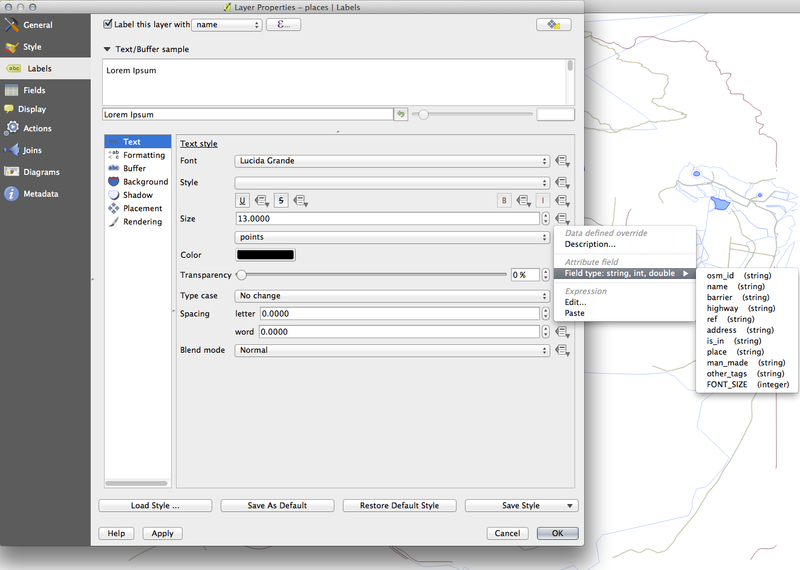 Set the widget to Value Map and click Load Data from Layer. 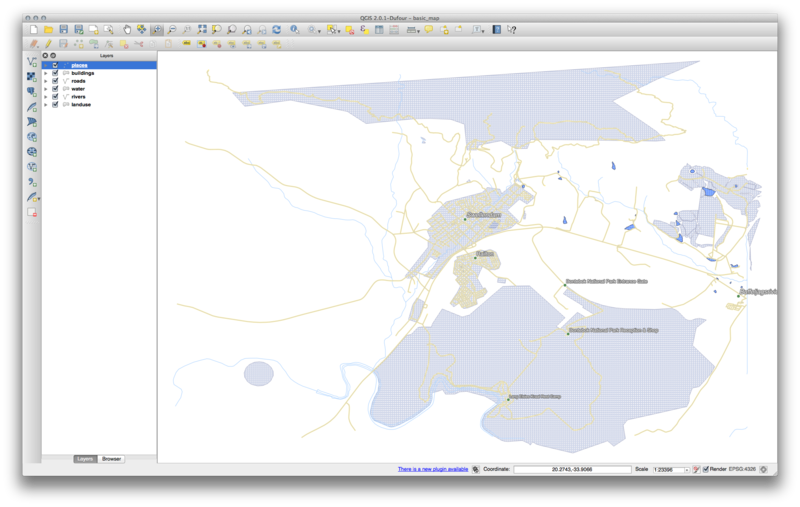 For the purpose of this exercise, the OSM layers which we are interested in are multipolygons and lines. 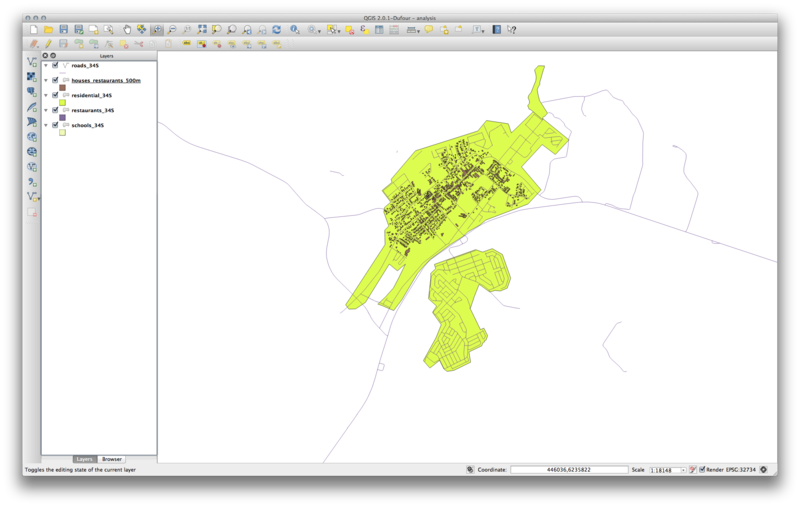 The multipolygons layer contains the data we need in order to produce the houses, schools and restaurants layers. 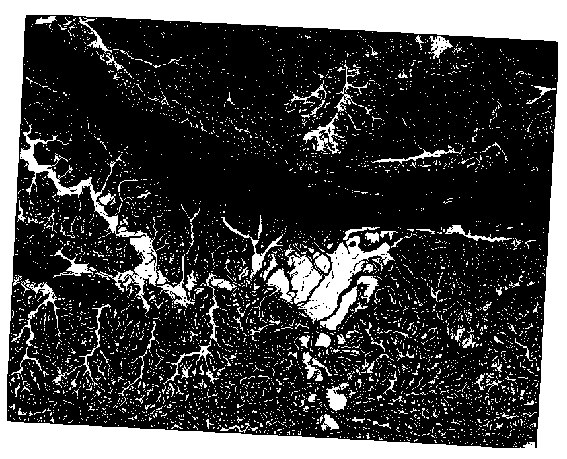 The lines layer contains the roads dataset. 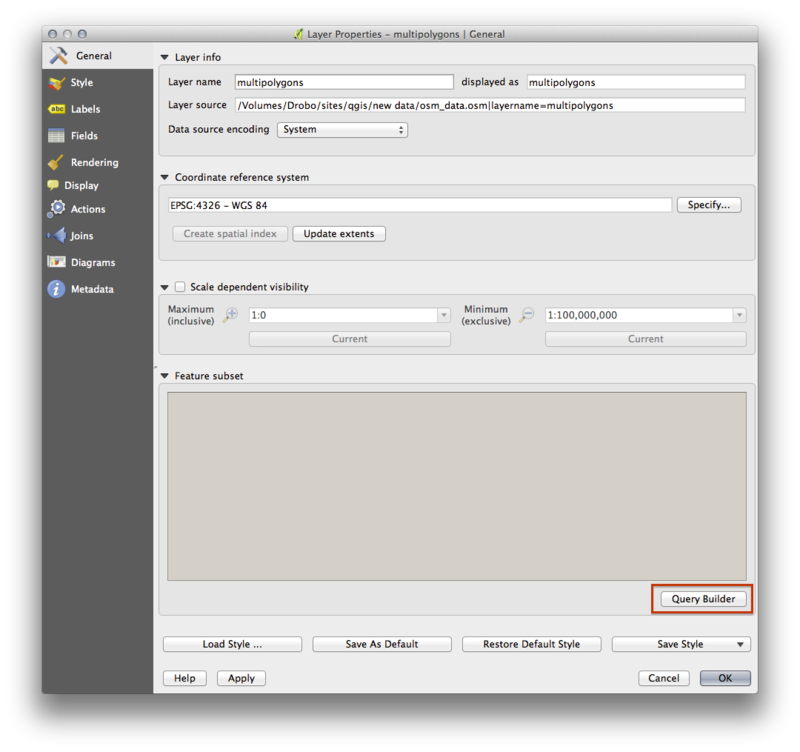 Duplicate the filtered layer, rename the copy, clear the query and create your new query in the Query Builder. Although OSM’s building field has a house value, the coverage in your area - as in ours - may not be complete. 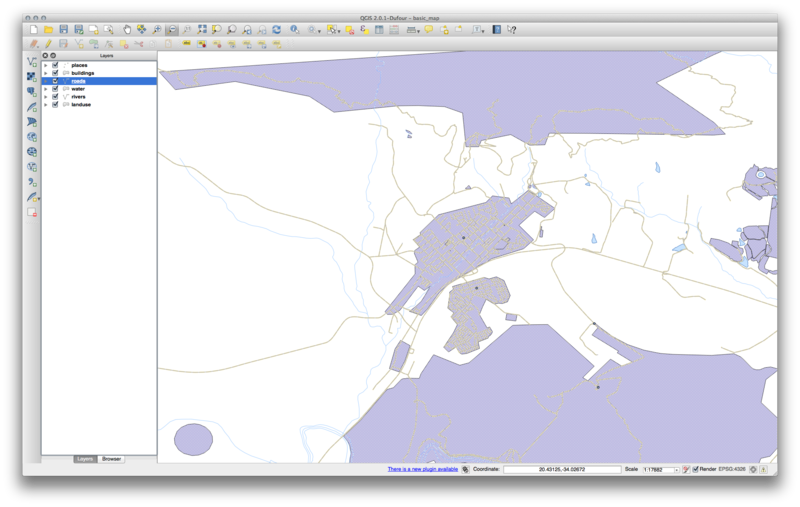 In our test region, it is therefore more accurate to exclude all buildings which are defined as anything other than house. You may decide to simply include buildings which are defined as house and all other values that have not a clear meaning like yes. The Buffer distance is 1000 meters (i.e., 1 kilometer). The first image shows the buffer with the Segments to approximate value set to 5 and the second shows the value set to 20. In our example, the difference is subtle, but you can see that the buffer’s edges are smoother with the higher value. 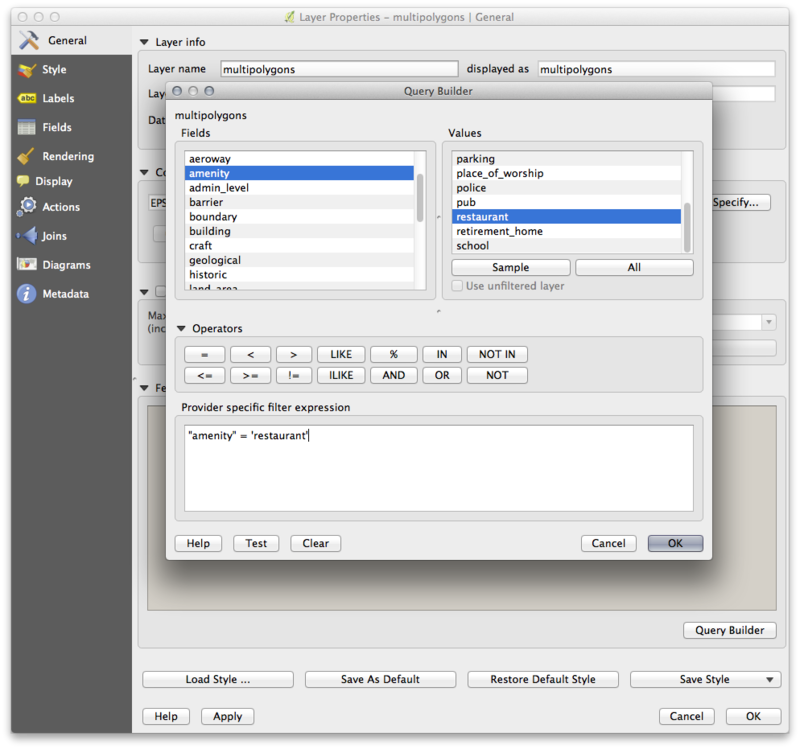 For the 5 degree version, replace the 2 in the expression and file name with 5. 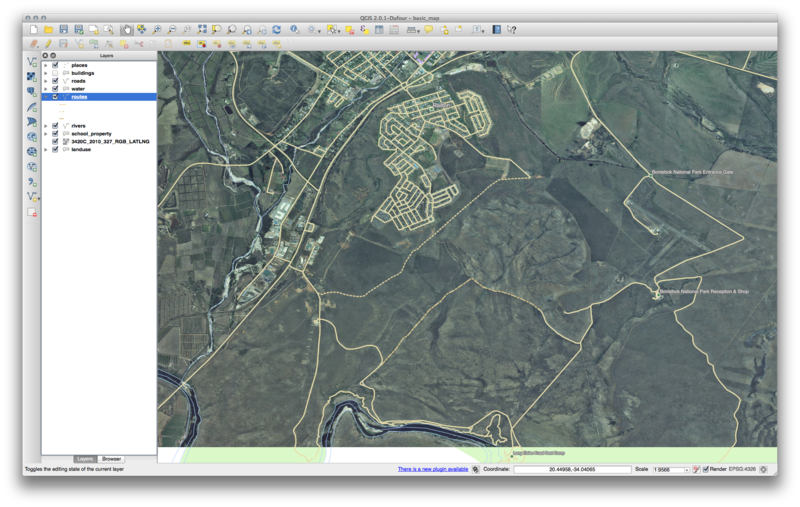 Open the Query Builder by right-clicking on the all_terrain layer in the Layers list, select the General tab. Then build the query "suitable" = 1. Click OK to filter out all the polygons where this condition isn’t met. 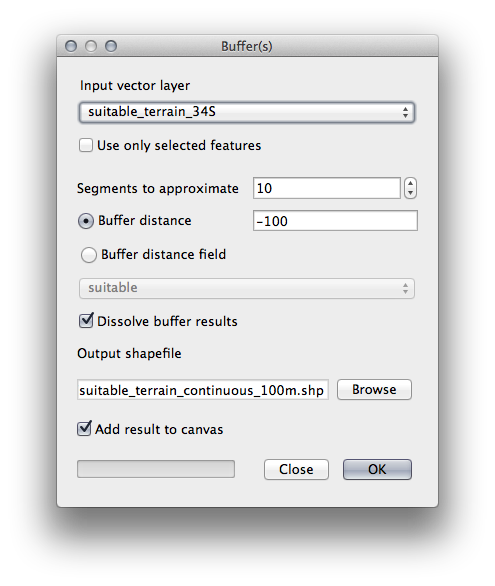 You can save this layer by right-clicking on the all_terrain layer in the Layers list and choosing Save As..., then continue as per the instructions. Consider a circular area, continuous for 100 meters in all directions. If it is greater than 100 meters in radius, then subtracting 100 meters from its size (from all directions) will result in a part of it being left in the middle. 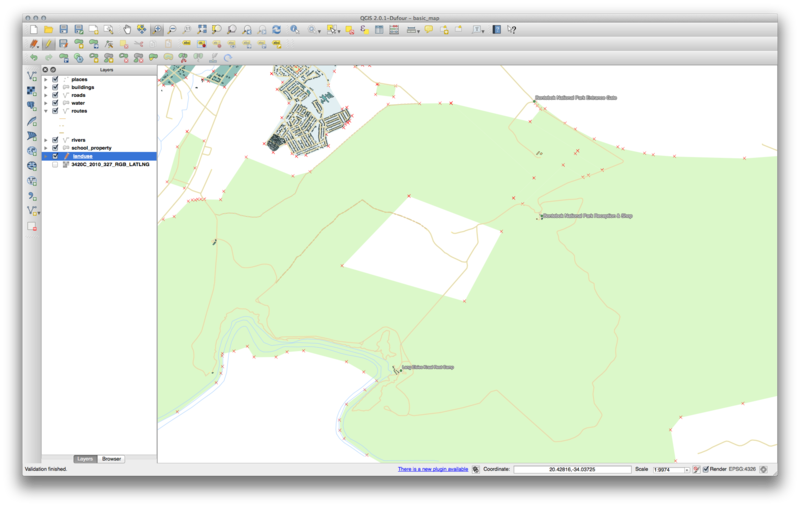 Therefore, you can run an interior buffer of 100 meters on your existing suitable_terrain vector layer. 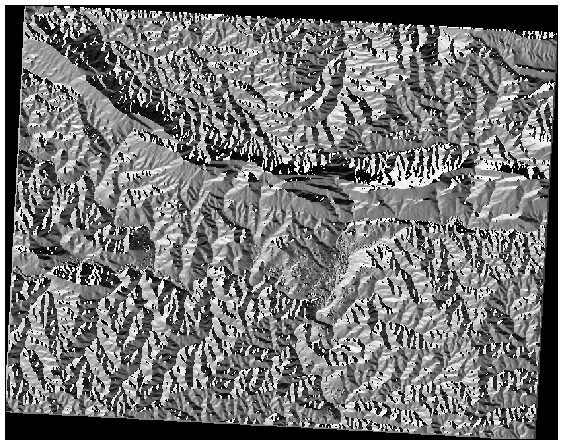 In the output of the buffer function, whatever remains of the original layer will represent areas where there is suitable terrain for 100 meters beyond. 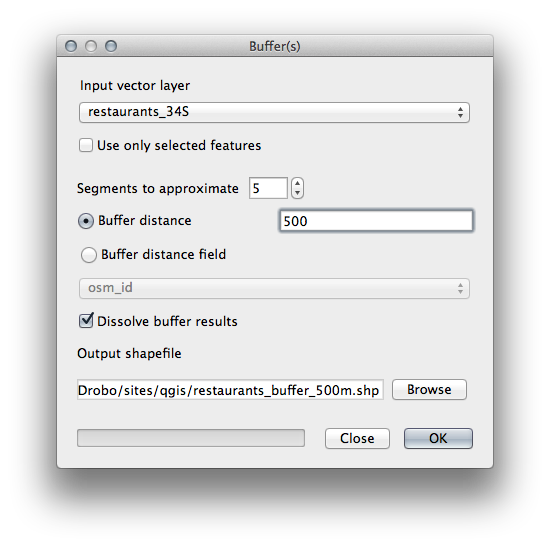 Go to Vector ‣ Geoprocessing Tools ‣ Buffer(s) to open the Buffer(s) dialog. 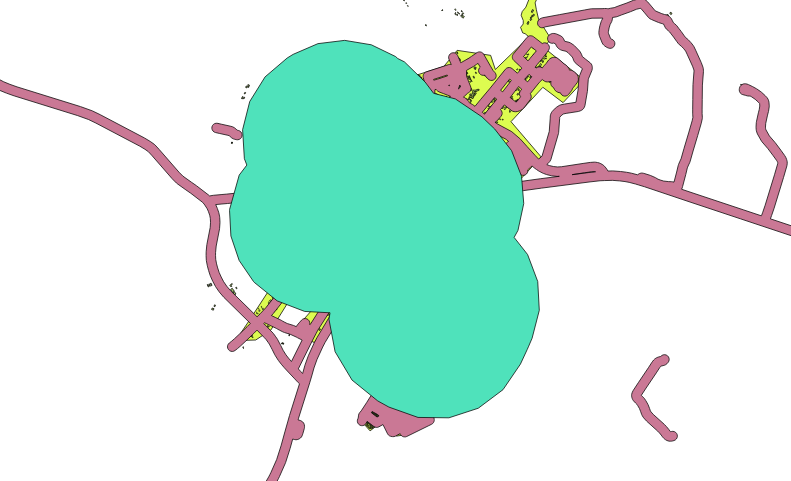 Save the output in exercise_data/residential_development/ as suitable_terrain_continuous100m.shp. 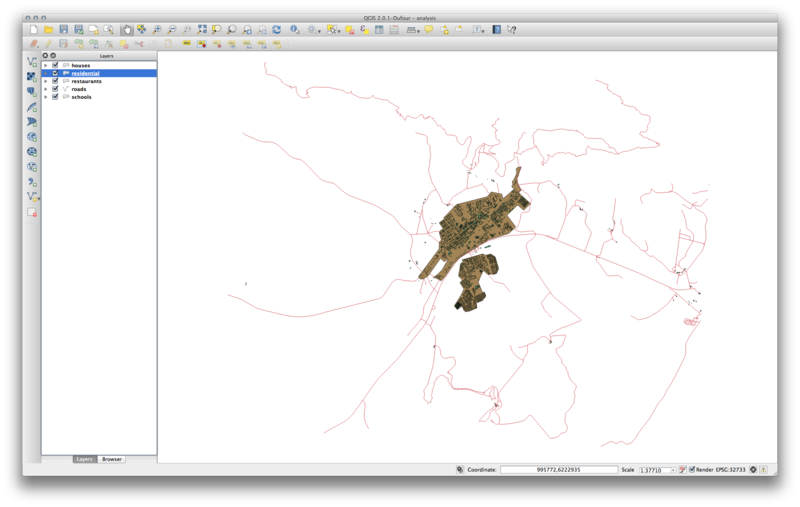 If necessary, move the new layer above your original suitable_terrain layer. 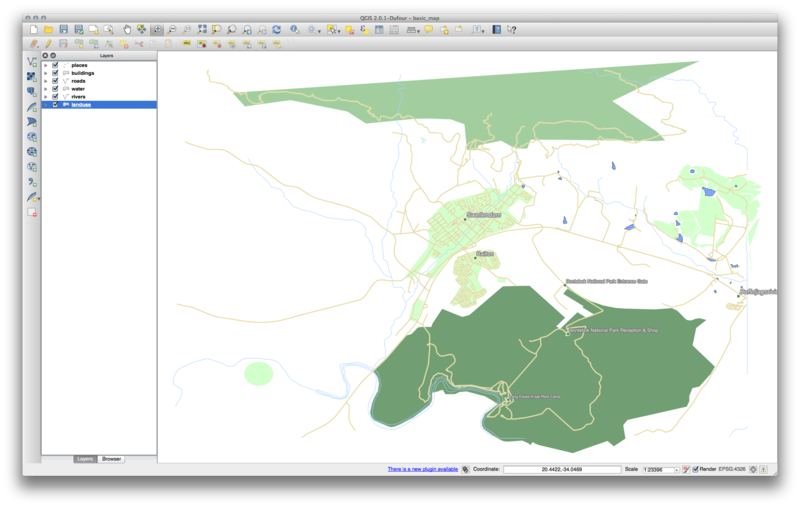 Now use the Select by Location tool (Vector ‣ Research Tools ‣ Select by location). 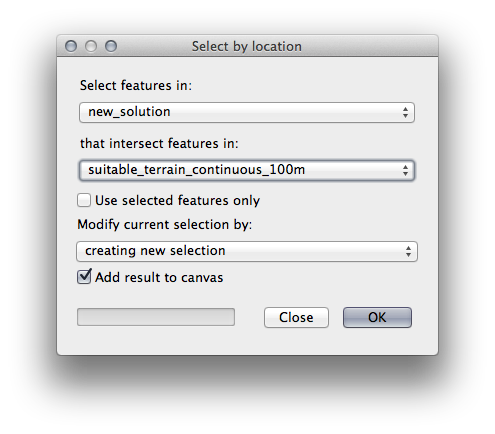 Select features in new_solution that intersect features in suitable_terrain_continuous100m.shp. 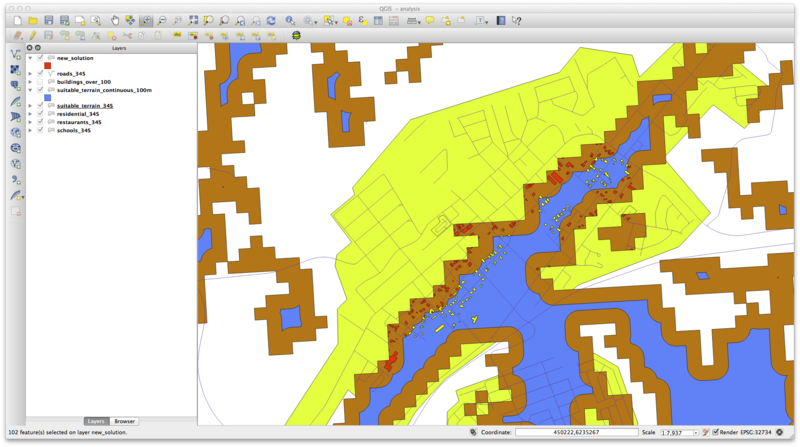 The yellow buildings are selected. 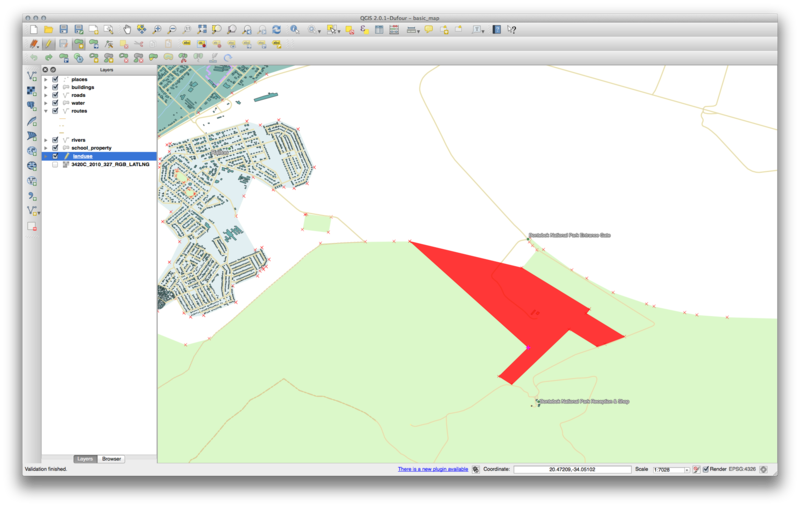 Although some of the buildings fall partly outside the new suitable_terrain_continuous100m layer, they lie well within the original suitable_terrain layer and therefore meet all of our requirements. 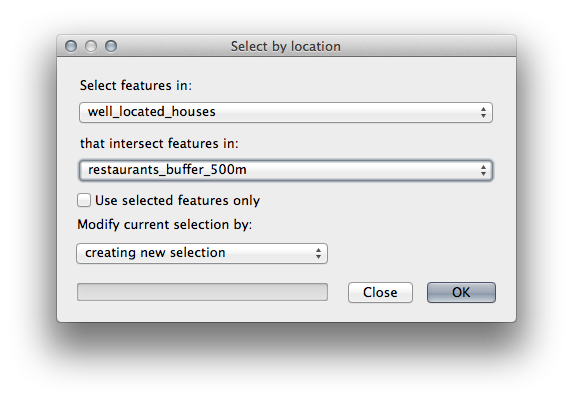 Save the selection under exercise_data/residential_development/ as final_answer.shp. 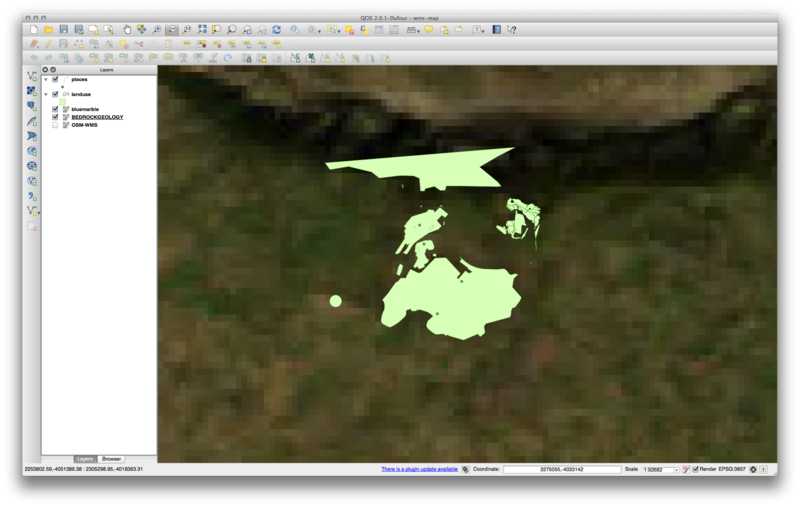 Therefore, it’s better not to use this data for the current map. The Blue Marble data is more suitable at global or national scales. 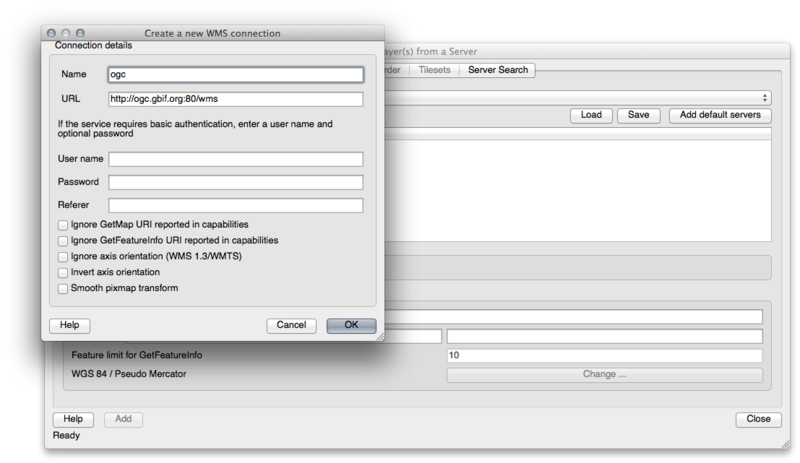 You may notice that many WMS servers are not always available. Sometimes this is temporary, sometimes it is permanent. 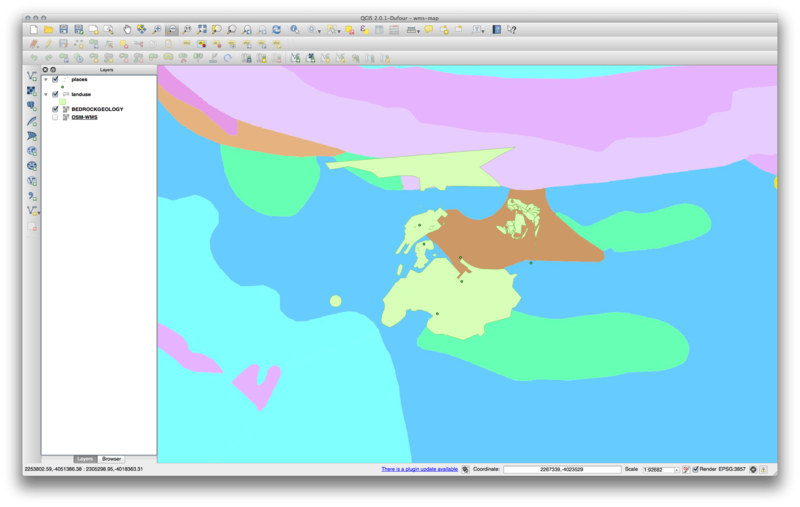 An example of a WMS server that worked at the time of writing is the World Mineral Deposits WMS at http://apps1.gdr.nrcan.gc.ca/cgi-bin/worldmin_en-ca_ows. It does not require fees or have access constraints, and it is global. Therefore, it does satisfy the requirements. Keep in mind, however, that this is merely an example. There are many other WMS servers to choose from. In the next section, you will learn about Foreign Key relationships which could be used in this example to further improve our database’s structure. 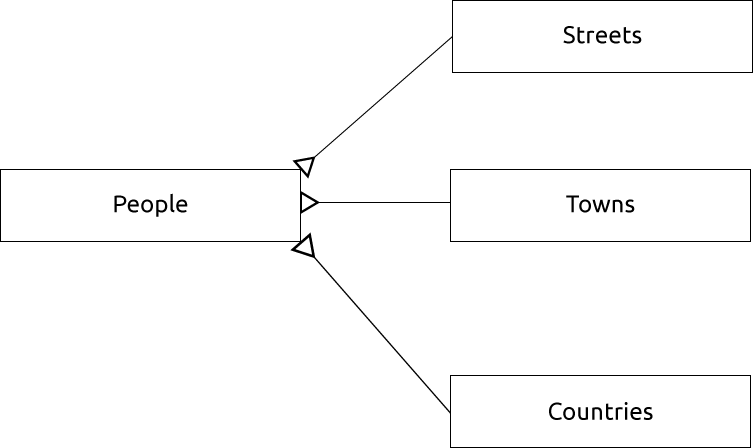 The street_id column represents a ‘one to many’ relationship between the people object and the related street object, which is in the streets table. For illustration purposes, we have purposely omitted the fkey constraint. The reason the DROP command would not work in this case is because the people table has a Foreign Key constraint to the streets table. 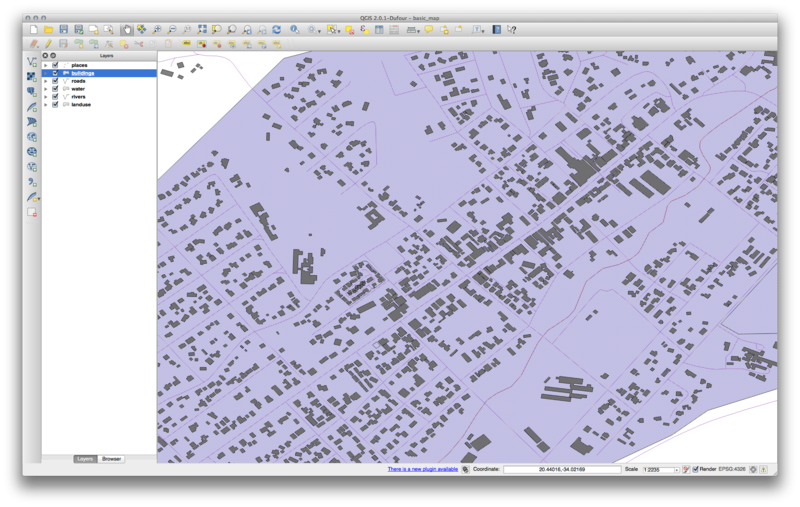 This means that dropping (or deleting) the streets table would leave the people table with references to non-existent streets data. It is possible to ‘force’ the streets table to be deleted by using the CASCADE command, but this would also delete the people and any other table which had a relationship to the streets table. Use with caution! If you look at the streets table again (using a select statement as before), you’ll see that the id for the Main Road entry is 2. That’s why we could merely enter the number 2 above. 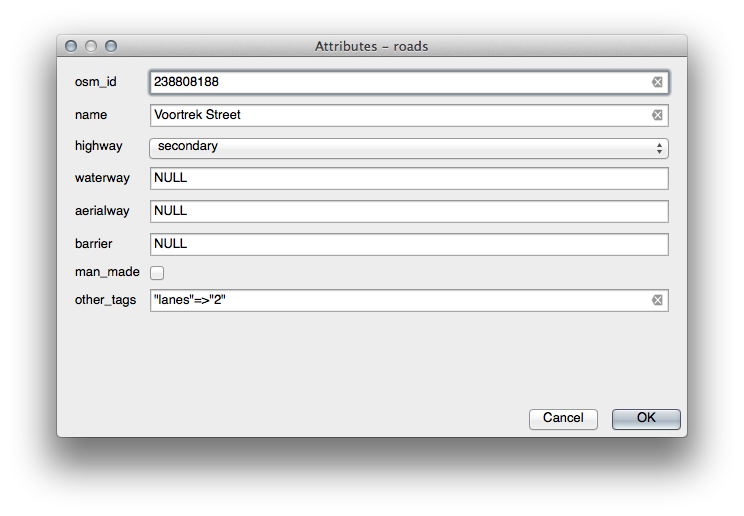 Even though we’re not seeing Main Road written out fully in the entry above, the database will be able to associate that with the street_id value of 2. If you have already added a new street object, you might find that the new Main Road has an ID of 3 not 2. You will notice that we have prefixed field names with table names (e.g. people.name and streets.name). This needs to be done whenever the field name is ambiguous (i.e. not unique across all tables in the database). 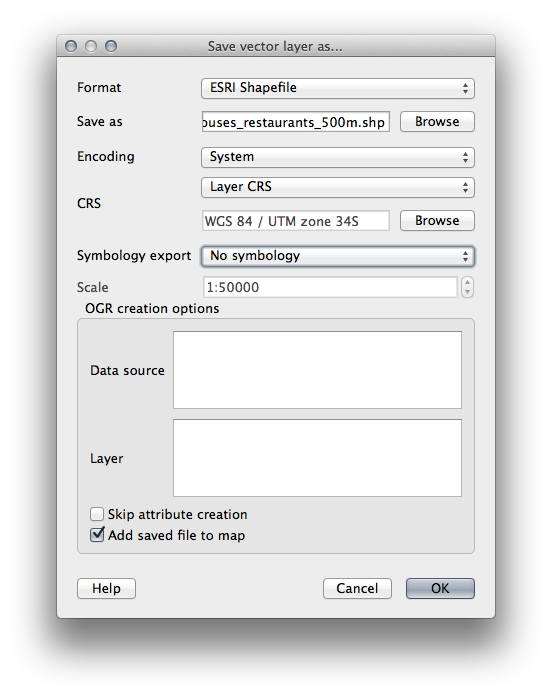 The units being used by the example query are degrees, because the CRS that the layer is using is WGS 84. 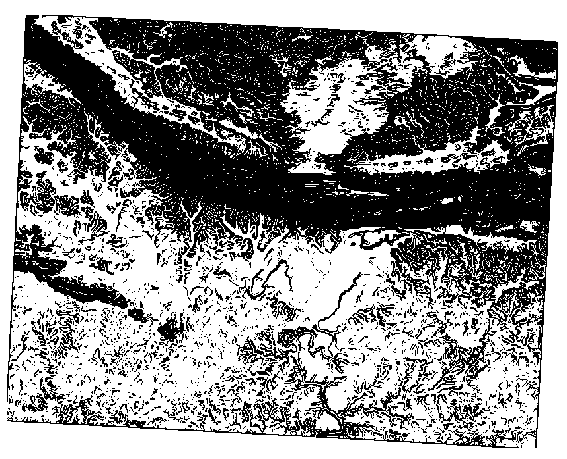 This is a Geographic CRS, which means that its units are in degrees. A Projected CRS, like the UTM projections, is in meters. Remember that when you write a query, you need to know which units the layer’s CRS is in. This will allow you to write a query that will return the results that you expect. 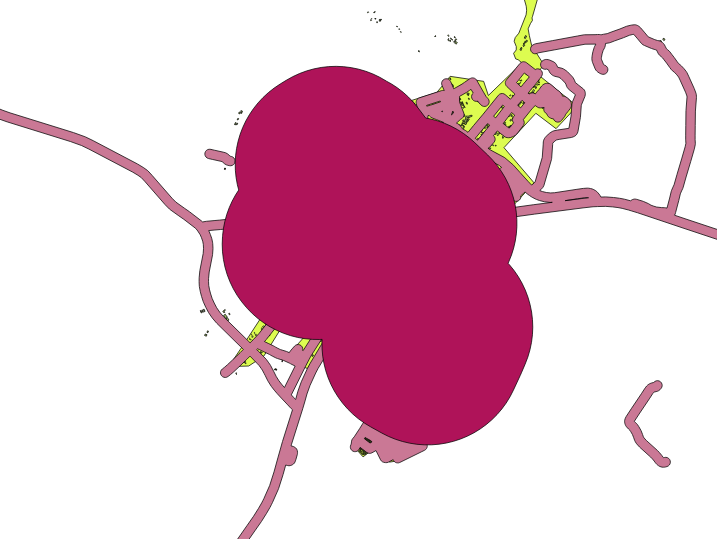 DETAIL: Key (city_id)=(1) is not present in table "cities". 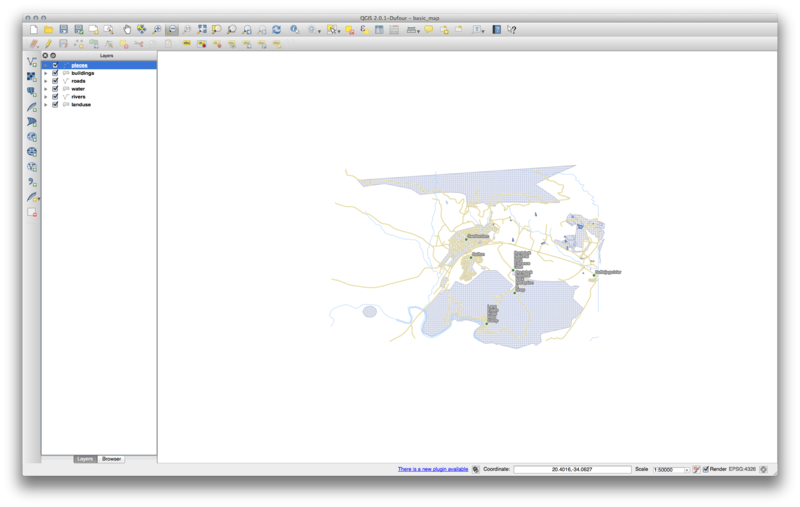 then it means that while experimenting with creating polygons for the cities table, you must have deleted some of them and started over. Just check the entries in your cities table and use any id which exists. As you can see, our constraint allows nulls to be added into the database.